Today's Sunday Scenery choices were easy as I was inspired to use a couple of pictures from my trip to Yantic Falls the other day based on some comments in my post from yesterday. The very last picture I posted was a black & white shot of the falls and several people commented that they thought they might like it better in color. I had converted the picture to black & white as it had been a pretty colorless day (i.e., a lot more clouds than sun) and I thought they were kind of drab but in going back over them I think I may have been wrong. 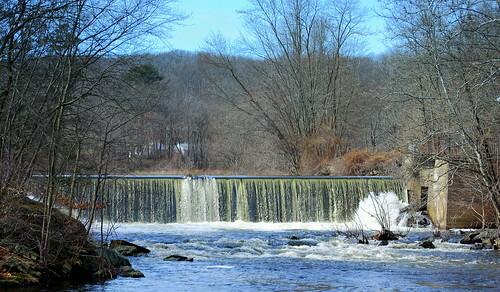 So, for those of you who thought the waterfall picture would be better in color, I give you several views of the Upper Yantic Falls located on the Yantic River in Norwich, Connecticut. What's really nice about these falls now is that they are in walking distance of my house so expect even more pictures in the future! This picture shows the falls in their entirety if you are standing near the railroad trestle that I had pictures of yesterday. See the side of the old dam to the right in the picture? That's where I was standing when I took the last shot in this series of pictures. I've not decided yet whether I was being incredibly brave or incredibly stupid! 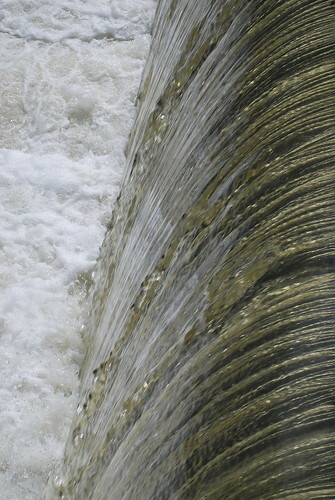 A close-up shot of the water going over the falls - and yes, the water was kinda brown! As you can see from this shot, on the far side of the falls, the water goes around and tumbles down a face of rocks. There's a memorial cross just to the left of where this shot ends which I think was put there for the last drowning victim. The area is posted with no swimming signs but apparently some people think that doesn't apply to them. Trust me, it does. This is the picture that I originally posted in black & white yesterday. I think I may have to agree with everyone that color adds more definition to the picture and the more I look at it in this version, the more I like it! 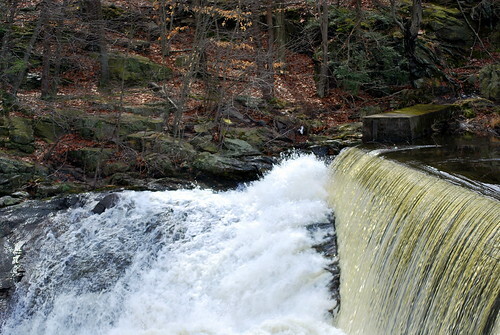 Finally, this is the shot I took while standing on the edge of the old dam that is very close to the falls. And yeah, I was a little nervous as falling into the water would not have been a good idea on many levels - especially the level of using a borrowed zoom lens from a friend and if I hadn't drowned, he might very well have killed me and I'm doubtful he would have erected a cross in my honor either! You should join in at Monochrome Maniacs - you have a good eye. I enjoyed the fall photo's on my coffee rounds this morning! The only thing missing is the sound of the falls... What Fun! Number 3, look at me! I love the color in the falls it looks like someone should be panning for gold! 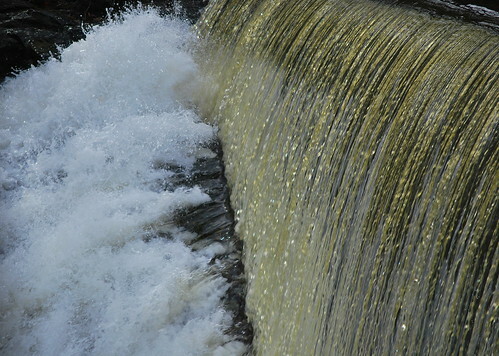 I *DO* like the falls better in color!Even with the brownish-golden color of the water. I also think it would look awesome in half-sepia. The first shot looks like it was ever such a bright day. Lovely colours and excellent composition. 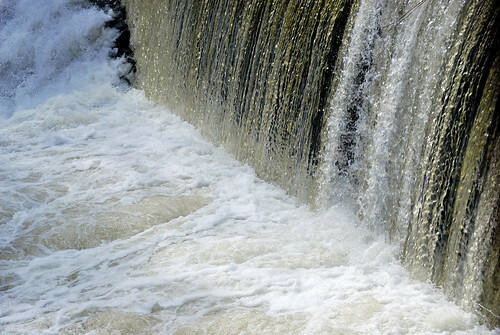 The following shots are a nice study into flowing water. Really good and sharp. The water is not just brown btw. It has many different colours. Really like these. These are quite nice, really. I love the colors and the flowing of the water. I can see the power in the water and with it, you can hear it as well. I think the falls actually look golden. There are pluses to both the black/white and the color; but I prefer the golden color. Please come visit my blog. I created an award for you and 2 others who helped pull me out of the blogging black hole I was in. Nice images of the falls, Linda. I love water scenes because for some reason they are always seem to be so tranquil. Yet there is a sense of power there too. Color may have added more definition, but I'll stand by my original comment that the black & white really brought out the sparkle in the water. Those photos are truly beautiful, but do try to avoid breaking your neck as we all want the scenic trips to continue. I went to look at the other post and quite frankly I like the B&W better. I've been really getting into B%W lately, it really gives a picture a whole different feel. Great shots. I think I like those falls better in color. Something about it makes it pop even more. Wow, I love the first photo, It's so beautiful, it captures the solemnity and the peacefulness of nature! As for the photo which was posted yesterday on black and white, I think that one looks more refined but.. sad hahaha. I prefer this colored one because the other side is kind of yellow or was that green or brown and then on the other side, it's already white! It's just cool lol. The water in the falls look great despite the brown/green color. It actually reminds me of those home decor waterfalls, where the water runs down the individual strings. Very cool looking Linda!! Oh I do love the color in these. I have been busy scanning old photos from my mom's house and most of them are black and white. I can't help but wonder what they would have looked like if color film had been avalible when they were taken.